Map of the Routes in India, with tables of distances between the Principal Towns and Military Stations. 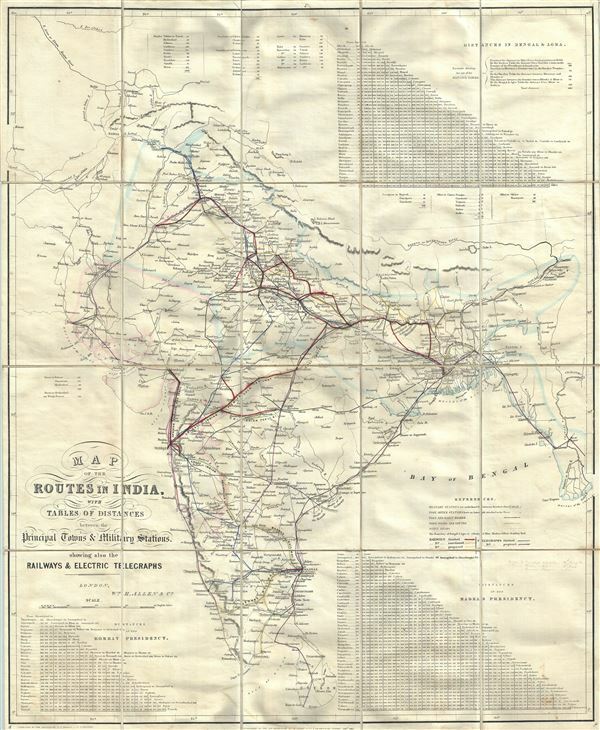 This is an excellent 1857 map of India by William H. Allen and Company. It covers the Indian subcontinent from Pakistan to Sri Lanka. The map is highly detailed, noting military stations, post offices, roads, railways, telegraph routes, towns, cities, rivers, as well as topography throughout. Three distance tables show distances in the Bombay Presidency, the Madras Presidency and in Bengal an Agra. The map depicts most of what is today modern India and what was, when this map was made, British India. In 1857, a year after this map was issued, the sepoys of the British east Indian Company would revolt in India's First War of Independence. This would ultimately lead to the dissolution of the east India Company. Subsequently governance of India was administered directly by the British Crown. The British Raj ruled India until its independence in 1947. Very good. Minor overall toning. Dissected and mounted on linen. Red line, indicating railways, shows minor smudges. Minor spotting.